I had recently received a sample Pop Weaver’s Light Butter microwave popcorn cooked in their newly formulated canola oil blend to try out so I tossed a bag in the microwave. In addition to tasting great, the popcorn popped up light and fluffy with just two minutes in the microwave. Plus, with only 210 calories per bag popped, it is a snack I don’t feel bad feeding my children. That isn’t the only benefit though. What more can you ask for in a quick, tasty snack? I have to admit that I would like a little more butter flavor on my popcorn, but Pop Weaver has that covered with the Butter and Extra Butter flavors for just a few more calories per bag. I’ll definitely be keeping an eye out for it the next time I’m strolling the aisles at the grocery store. At only 21 cents per bag, it’s a great snack to have on hand! 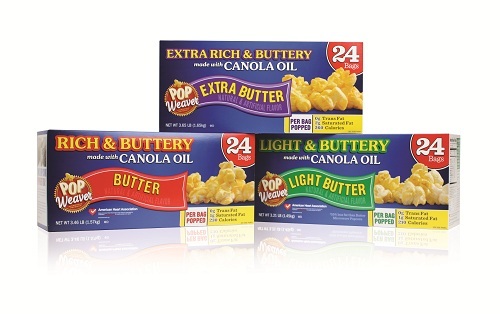 If you would like to try out Pop Weaver’s new microwave popcorn made with canola oil, you’re in luck! I have two 8-count boxes of popcorn to give away to two lucky commenters! All you have to do to enter the giveaway is leave a comment below. I’d love it if you would tell me what your favorite healthy snack is or what you like to munch on during movie night. Be sure to leave an e-mail address where you can be reached if you win! Contest will close Wednesday, August 18th, at 11:59 p.m. CST. You must be a U.S. resident, or have a U.S. postal address to participate. Two winners will be chosen from all eligible comments via random.org and notified by e-mail. Popcorn is my favorite snack for movies along with a few twizzlers. I like to pop the popcorn then sprinkle parmesan cheese and garlic powder on it. yum!